I definitely have to read this variation. I keep saying that I have to read N&S variations but I have not started yet!! Nice review, Rita 🙂 I think I would also miss the moments between John and Margaret. This was a lovely story, Elaine! I thoroughly enjoyed it. Thank you for gifting us with your talents. This book sounds good,but,as I’m a romantic at heart,I’m a little concerned at the lack of shared moments of love between John and Margaret. However,if still like to read it and look forward to seeing Hannsh in a more supportive role. Fanny will probably just be like Fanny!!! 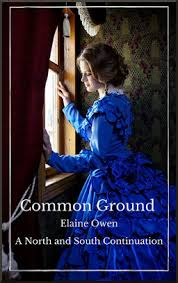 Must check out the interview with Elaine Owen next week. Love N&S, so it’s nice to see a variation for it, too. That would be interesting to get more details about the speculation going on since it was such a big factor in the original. Always fun to see what an author does with the characters like Hannah and Dixon, etc. I too may have to give N&S books a go. I know I loved the series on BBC so I am hesitant I have no idea! LOL! I have read several either sequels or variations of N&S and have another one recently recommended to me. So this will just have to go on the TBR pile. Thanks for bringing it to our attention.